Get your brain wet and your hands dirty! Join Friends of Accotink Creek to get the trash out during the Potomac Watershed Cleanup along our 12 adopted stretches of Accotink Creek. Beat the litterbugs! Read updates from the cleanup in progress. Will Blake Lane Park remain a park or be developed as a school at the loss of open space and wooded habitat? A case of questionable compromise of principles in Resource Protection Areas. Application has been rejected yet again. A drainage pipe failure contaminates a vernal pool at Lake Accotink Park. Another problem at the INOVA campus affects our neighboring watershed. New studies after last year's public meetings have yielded new information and new perspectives. Expect the Master Plan public meetings on the future of the lake to resume soon. Neighbors get together to clean up dumping sites along Americana Drive in Annanadale. High school student inspires volunteer action to better the environment in our watershed..
Small park gets a big restoration of native habitat. All plastic bag bills again failed to get through the Virginia General Assembly in 2019. The bulldozers are devastating the trees along I-66. Be on the lookout for erosion and sediment violations!! Helping the Holmes Run watershed by reporting erosion control failures at a major construction site. Is this the right land use in the right place? "A happy event that will make the Earth smile"
The Trash Action Work Force protests at Nestle USA against the plastic trash poisoning our watersheds! Thanks to all the Friends of Accotink Creek who joined the International Coastal Cleanup along our 12 adopted stretches of Accotink Creek in 2017. Thanks to all their efforts, we together removed 234 bags of trash, 11 tires, and junk ranging from a fire extinguisher to bicycles. Nature continues to reclaim Wakefield Run after its restoration. Read the background story and follow our periodic updates! An appeal to aid our neighboring watershed to the east. Young minds apply their hands and hearts to study and preserve our watershed. Visit the small headwater tributary streams of the Northwast Watershed, many threatened by the I-66 widening project. Visit Hatmark Branch, a small headwater tributary threatened by the I-66 widening project. An examination of lingering erosion and landscaping deficiencies from the 495 Express Lanes. Yellow passionflowers and Purple passionflowers - be "passionate" about the imperiled Accotink Gorge. Our workdays to eliminate invasive wisteria threatening native flora make progress! ♦ The end is in sight! Draft TMDL's released! Hear the candidates respond to environmental questions that concern our future. You are invited for a day filled with fun! Door prizes, Candies and Eggs! Make your feelings about protecting our environment known to decision-makers. Remember your watershed when you vote this June. Volunteers assess ecological conditions in streams, based on the abundance of invertebrates. 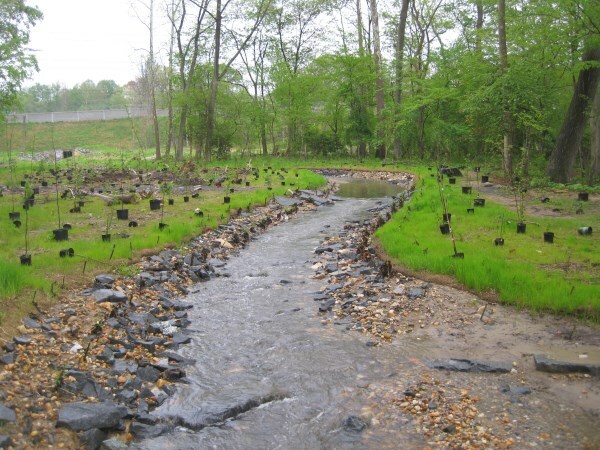 Property enhancement equals watershed enhancement with Conservation Assistance $$$. Shape the Future of Friends of Accotink Creek. Join our monthly planning meetings! Join us each Wednesday in defending our parks from green invaders.